Built from Bronco 1/48 kit. Certainly is eye-catching, my friend….nice work. Very nice. You’ve gotten the details to pop despite uniform color coverage. Really nice looking! But hey, only one photo? Oh….YES. It was done about 4 years ago and I just took one photo of this plane. You are certainly the guy for unusual schemes – very creative! YES. It’s really special. This state is in the testing period which is the time between out of factory and joining the air force or the navy. Strange you should mention that….it’s exactly what I was thinking when I first viewed it with no insignia/markings. I really really love this model and the way u finished it in yellow primer. It looks really cool. Would love to see more pictures of it! A stunning photo of a well-done model! 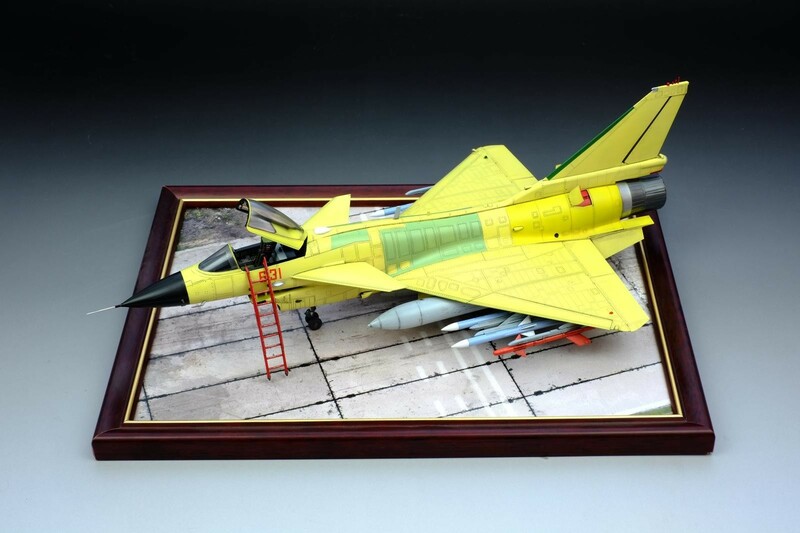 This is just plain modeler abuse…one photo of some eye candy and the rest is for the imagination. More photos please. How we suffer for our art. Hi. I am really sorry that I just keep one photo this plane and sadly it is not on my hand now. Your work is really consistent – a good thing. The use of color here is really interesting, and you have made the model really interesting. Live from Telford: Zoukei Mura’s 1/48 Phantom.